Rotathene® SUPA UV provides superior protection for rotomoulded products by incorporating advanced additive technology. As seen in our article, Testing Poly Tank UV Protection: SUPA UV Sun Protection, Rotathene® SUPA UV incorporates advanced additive technology to provide UV protection well in excess of the standards specified, more than 4.5 times and even higher depending upon the SUPA UV colour of your poly tank. The main purpose of a tank is to hold water or chemicals. In order to do this, a tank needs to be designed to withstand loads applied to the tank, in particular the pressure of the contents. Polyethylene stretches slightly when a load is applied to it such as when the tank is filled and being able to predict how a tank will behave when it is filled and used over many years, is very important. In order to do this one needs to understand how the PE stretches or ‘creeps’ under stress. Extensive creep testing is conducted both locally and overseas on Rotathene® SUPA UV tank grade materials. This testing is performed under different stress levels and at different temperatures to obtain information that is vital to professional design engineers who design these tanks. The design of the tank is checked using Finite Element Analysis (FEA). This is a special computer design program used by design engineers which predicts how the contents of the tank will affect stress intensities in the tanks and what deflections or level of creep may be expected due to this stress over a reasonable service life. 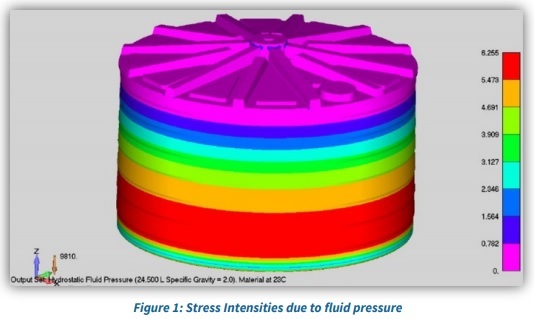 Figure 1 shows the stress intensities generated in a tank by the contents. The red areas have the highest stress intensity and pink the lowest. As one can see from this, the highest stress will be found near the base of the tank wall where the pressure is greatest, as one may well expect. By using FEA, the appropriate wall thicknesses can be determined and the effect of design features can be examined to optimise the expected performance of the tank. This analysis is done using the assumption that the tank will be properly installed on a flat and level platform and that the tank is plumbed correctly. Understand that a sloping platform or presence of stones or anything else causing an uneven surface under the tank will introduce stresses which would not have been accounted for in the design and could have adverse consequences to the life expectancy of the tank. The same may be true of heavy or rigid fittings which are attached to the tank without due consideration for appropriate support and movement. It is therefore important to follow the installation instructions fully. Through careful selection of a high quality Polyethylene base polymer specially designed for tanks and having the increased SUPA UV level of protection, the National Poly Industries Group in conjunction with its material supplier, Matrix Polymers, can ensure that it has the best materials with which to make their tanks. Using professional design engineers and Finite Element Analysis in the design of these tanks as well as moulding and testing the tanks to the requirements of the Australian Tank Standard AS4766, optimises the properties of the materials used in the manufacture of these tanks and affords the end user the knowledge that they have a superior product designed for the harsh Australian conditions.